Skunks are synonymous with an unpleasant, strong scent, which they use as a defense mechanism. However, that’s not the only reason they are unwelcome around your property. 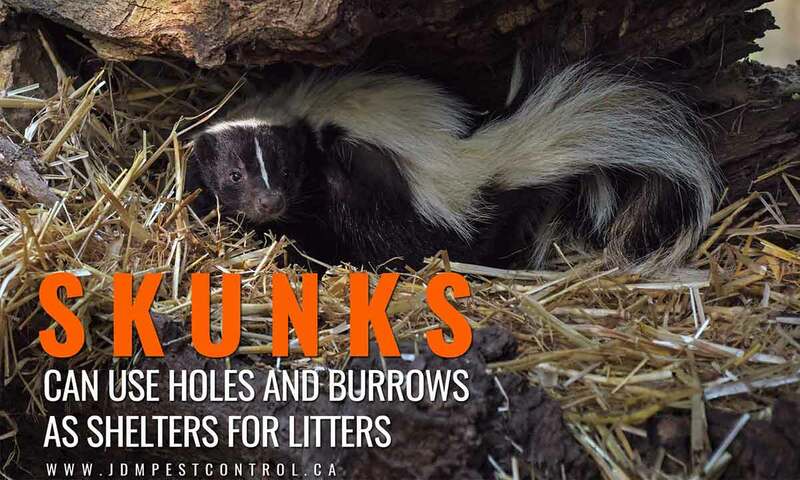 Like raccoons, skunks can also forage through your trash in a search of food, dig around the yard for insects, burrow under the house, and chew up wires. Because of a skunk’s spray, removing them on your own is out of the question. Skunks are potential carriers of rabies, which can make their bites and scratches lethal. In the spring, nesting skunks may also have a litter of kits (babies), which are difficult to remove. Removing skunks and other pests is best left to pest control professionals. Set up barriers – Skunks like making their homes in sheltered areas (e.g. under decks or porches). Close off these spaces with barriers like fencing or plywood to keep the skunks out. If there are gaps under the house, check that there aren’t any skunks there already. If there aren’t any, seal the entrances. Skunks are poor climbers, and fencing can keep them out. However, they are good diggers, and can create openings under barriers if there’s a gap on the other side. Barriers should extend below the ground to make it completely impassable to skunks. Log piles and bushes can be tempting places for skunks to nest. Store any materials in sheds to keep skunks away. Trim bushes and shrubs to make them less appealing as shelters for skunks and other pests. Fill holes – Skunks often dig holes, use existing ones to burrow inside, or to hunt for insects. Holes in your yard are often a sign that an animal has gotten into your yard and those holes need to be filled immediately. Be especially careful in the spring; skunks often use burrows for nesting, and there may be skunk kits inside. 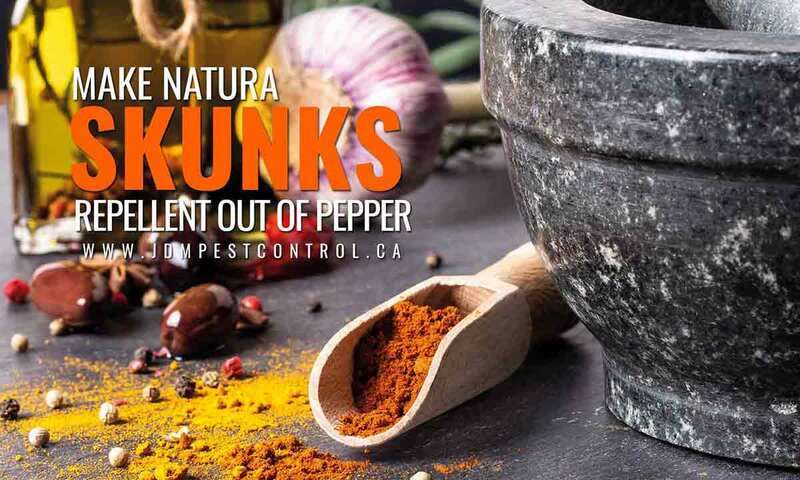 Remove food sources – Another way to remove skunks and other pests (e.g. ants) is to remove any outdoor food sources. Skunks may find bird seed and pet food attractive. Protect your bird feeders from skunks by placing a tray underneath to catch any fallen seeds. Check the feeder often to pick up any seeds that have spilled where skunks can reach them. Always store pet food indoors to keep the smell from attracting skunks. Feed pets indoors as well to avoid spilling food outside. If you have any plants or bushes that bear nuts, berries, or fruit, check the ground for any that have fallen and remove them. Harvest your crops when they become ripe to avoid attracting skunks and other interested pests. Animals can also wander into the yard looking for easily accessible water. Remove any water sources from which they can drink to make the grounds less appealing. Protect your waste – Like raccoons, skunks aren’t shy about going through garbage for food. Bins secured with bungee cords or “raccoon straps” protect your garbage, keep skunks away, and remove the need to clean up unneccessary messes. Consider storing garbage bins inside (in a shed or garage) at night for extra protection and to manage enticing smells. Tying up garbage bags before putting them in the can creates another layer of defence against the smell. Use bright lights – Skunks are nocturnal animals, and are sensitive to bright lights. Since skunks usually forage for food at night, sensor lights can scare them from the yard. However, keeping lights on all night isn’t the most effective method of repelling skunks. Besides paying for electricity, you may inadvertently attract other pests like moths and crickets. Use motion-detector lights to save on costs; they will only activate is a skunk gets close to your house. Consider using solar fixtures with LED capacity; their bulbs can charge during the day and use less energy after nightfall. Install automated sprinklers – Automated sprinklers are a good way to keep skunks away while you’re asleep or out of the house. These sprinklers can sense any motion from animals that enter the yard. 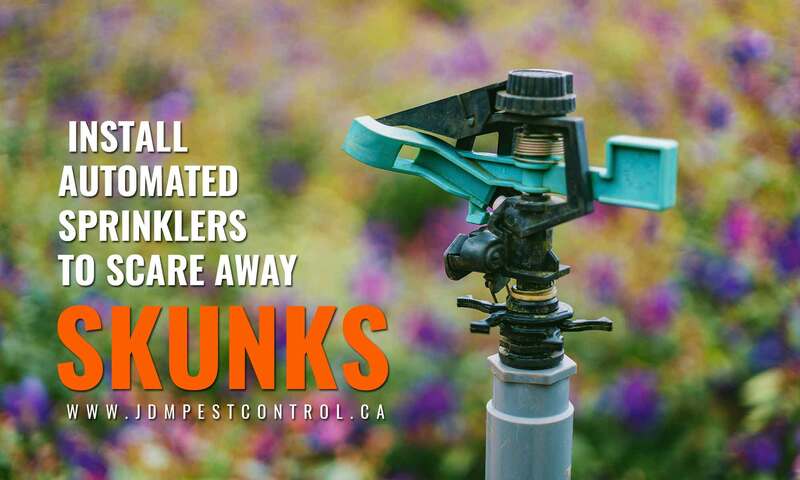 Pests that come near the sprinkler will trip the sensor and trigger a spray of water. The sudden spritz can scare skunks from your property without causing them any harm or disturbing the yard. Automated sprinklers are a safe, natural method of deterring skunks and other pests. For best results, place them in strategic areas where skunks are likely to shelter. You may have to invest in more than one sprinkler to have adequate coverage. To avoid unexpected costs, calculate for the added expenses associated with sprinklers (e.g. water usage) before installing. Apply skunk repellents – There are skunk repellents on the market you can apply around the property to deter skunks. Many of these repellents are natural, so they won’t harm kids or pets. There are several options, including predator urine (e.g. from dogs or foxes). These products can be purchased from most hardware stores and sprayed around the perimeter of your yard. You can also make a homemade spray from peppers and water. Spray this on trees and other places where skunks may reside. Many of these sprays will be washed away after it rains so they will need to be reapplied to keep the protection in place. Citrus peels are a longer-lasting option. Simply sprinkle orange or lemon peels where skunks are likely to go (e.g. under the porch or around the perimeter of a house). Citrus peels offer cost-effective protection as they last until they decompose (which can be up to six months). They can also repel other pests to keep your house safer from other infestations. The most obvious sign of a skunk infestation is the smell of musk (the scent of a skunk’s spray). Look around for those aforementioned small holes in the yard since skunks use these holes to hunt for insects or for shelter. You may also find skunk feces, which usually contains seeds, animal hair, or insect remains. These signs make the skunk presence easier to identify. If you’ve ever been sprayed by a skunk, you know it’s not an experience you want to repeat. These tips can help keep skunks away from your home and your family. 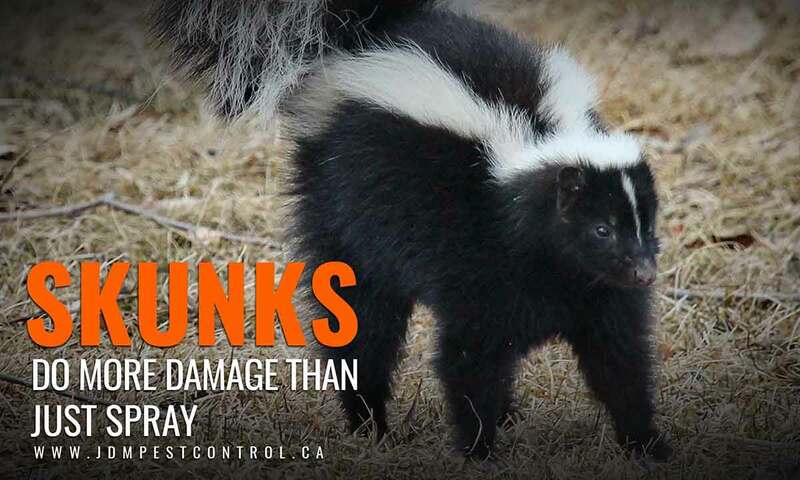 Beware of kits because young skunks are prone to spraying anything that startles them. Skunks can carry diseases and it’s good to avoid contact. If you find you have a problem with skunks, it is better to call a professional pest removal company. Professionals have the training and equipment to remove skunks without causing damage to them, you, or your pets. They also provide expert advice on how to avoid future infestations and reduce the chances of it happening again. 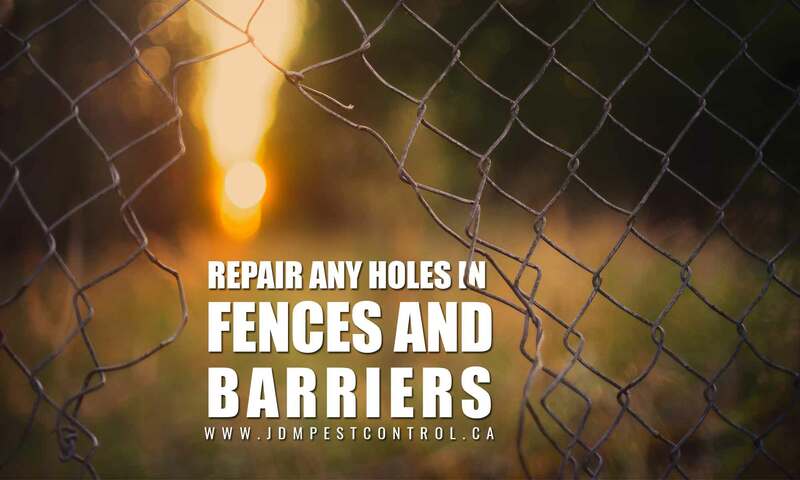 Contact JDM Pest Control for reliable pest control for skunks, mice, and other pests in the GTA. 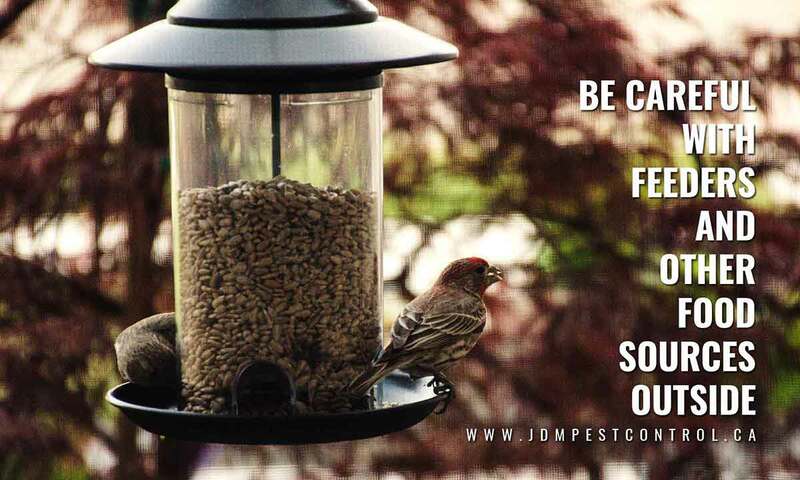 At JDM Pest Control, it is our mission to provide our customers with long-lasting service. We are committed to effective, eco-friendly strategies to solve your problems right the first time. 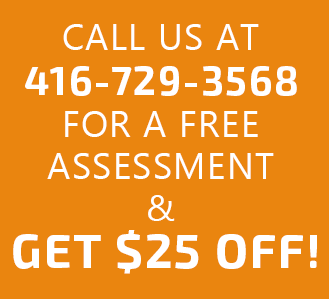 Contact us at (416) 729-3568 for a free assessment.